Our range of products include polycarbonate hollow sheet, hollow sheet, pc foot over bridge sheet, foot over bridge sheet and sky walk sheet. We have uniquely positioned ourselves as a topmost organization, engaged in offering Polycarbonate Hollow Sheet. PC Lite is a light, strong, insulating and attractive sheet for use as roofing, cladding, glazing and other applications in construction, advertising, agriculture, industry and DIY. A lot can be saved on energy cost by using this on windows, walkway or overhead bridge. Besides, they are ideal for solar reflectivity and roofing for hot climate. 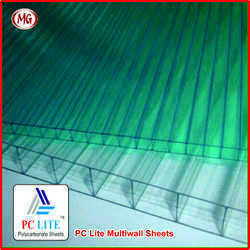 PC Lite Multiwall Sheets can also be used in canopies, shopping malls, car parking’s and walkways. 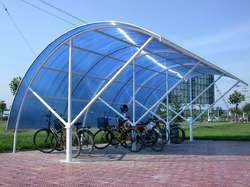 Some of the major properties of multi wall polycarbonate sheet include unbreakable, superior impact strength, 90% light transmission, self extinguishing and TAC approved, light in weight and easy to install. We also manufacture tailored lengths in order to minimize waste of the sheets. Standard Colors: Clear, Bronze, Opal, Lake Blue and Green. Special thicknesses, Colours and Lengths can be produced to special order, subject to special conditions. When used for roofing it is crucial that the roof has a minimum slope of 2.5°. When using glazing bars and covering trims, mechanical fixings are not required, though strongly recommend in areas with high wind speeds. Drilling: Use only new or sharply ground steel or carbide tipped drills. All holes must be drilled at least 40 mm from the edge of sheet. After cutting and cleaning the sheet, tape off the top of the panel with a non-vented tape and the bottom with a vented tape, to prevent contaminants and moisture entering the flutes. Usually a finishing trim in the style of a ‘U’ profile is used to cover the vented tape. Do not remove the protective tape before cutting or installation. 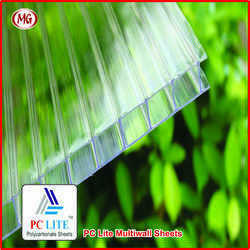 PC Lite is the brand name for MG Multiwall Polycarbonate Sheets. PC Lite is designed to resist impact and are far better than conventional glass and other acrylic material. These sheets are easy to handle and install, virtually unbreakable and can resist extreme weather conditions. Insulation against heat and cold is one of the most important properties. PC Lite has a long working life and carries a 10 year warranty against yellowing. 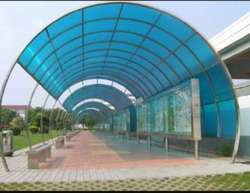 We are highly acknowledged in market for presenting best quality of Hollow Sheet. Highly appreciated by our clients these products are known for their quality and more demanded by our patrons across the globe for its durability. These products protect from UV harmful rays. These products. Multiwall co extrude sheets ultra-violet (UV) protection layer on the top surface of the sheet. We are the manufacturer of PC Foot Over Bridge Sheet. We are the manufacturer of Foot Over Bridge Sheet. 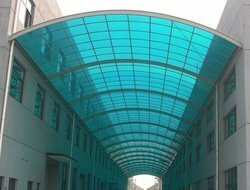 We are the manufacturer of Sky Walk Sheet.